The city of Phoenix is about to get a new landmark. Nicknamed "The Pin," the tower will be over 420 feet tall and feature a unique spiraling observation deck in the shape of a sphere. It will be located in the downtown area and provide a spectacular 360 degree view of the city and the surrounding mountain ranges. 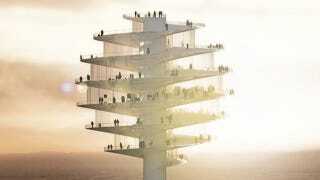 The 70,000 square foot tower was designed by BIG, a Danish architectural firm. In addition to the dramatic open air observation deck, the tower will contain an ever-changing series of exhibition spaces, along with some shops and restaurants. A new public square surrounded by shops will also be built at the base. Visitors will take an elevator to the lowest level of the observation deck and then gradually work their way up to the top. Because it's in the shape of a sphere, the middle portions will bulge out, providing the largest observation areas. Phoenix-based developer Novawest commissioned BIG to create "a destination event to provide tourists and citizens of Phoenix alike the chance to enjoy the unique features of the Valley of the Sun."